So this happened on my ride tonight. Since we were far from home, I didn’t have much choice and pedaled standing up for 6 miles to the nearest open restaurant. TBO manage to rig the saddle back on so that I wouldn’t impale myself on the seatpost along the way. It was pretty hard moving forward without the ability to coast, but TBO rode the entire way out of his saddle as well out of solidarity (such a sweet husband) and we took several breaks to rest my cramping calf muscles. I’ve had this saddle on the Hunter for close to three years now. Checking on the company’s website, it looks like they’ve recently upgraded their rails to chromoly; I’m wondering what material they used for their older models. (I’m going to ask them via email to see if they’ve had any other customers report failures.) 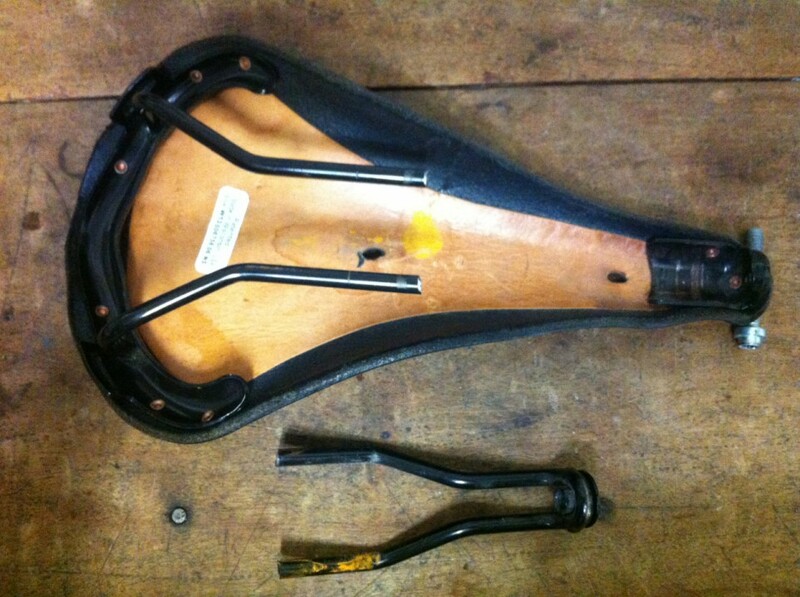 Anyhow, it seems that I can just replace the frame as the rest of the saddle is in fine condition (although getting a new non-slotted one would be just a few dollars more). I’m just glad it didn’t break when I was descending a hill or some other potentially disastrous situation!